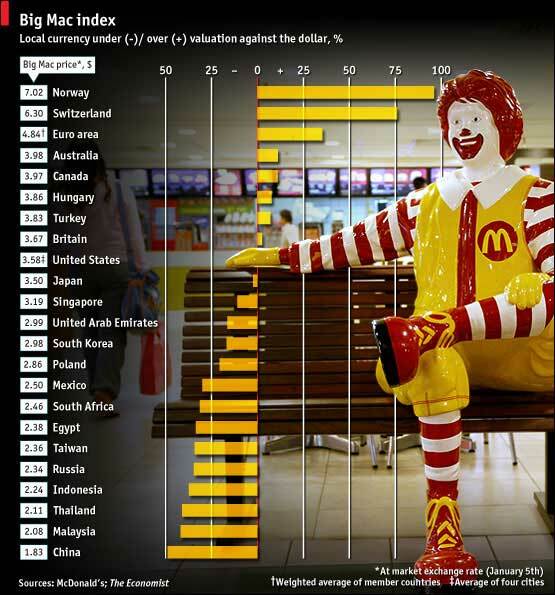 The Big Mac Index, which tracks exchange rates for a large number of currencies, has the Norwegian kroner as the most overvalued currency against the greenback. The index tracks exchange rates over the medium to longer term in accordance with relative purchasing power parity [PPP] theory. According to the Economist, the Norwegian kroner is 96% above its PPP rate. In Oslo you can expect to pay around $7 for a Big Mac. Swiss Franc seems significantly over-valued as well. At the other end of the scale is the Chinese yuan, which is undervalued by nearly 50%, based on the latest Big Mac Index. The euro comes in at 35% over its PPP rate.